Go to the Settings tab, in the main navigation menu, then select General. 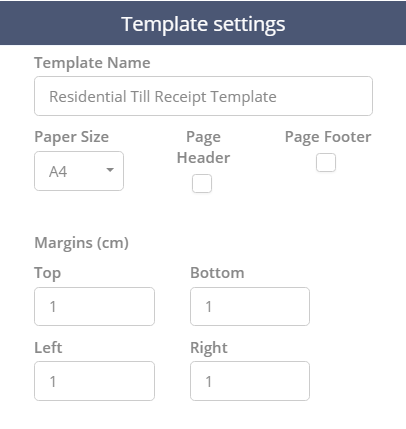 Select the layout you want to use - You can start creating your template from scratch, using the blank; or you can use a pre-existing layout which can help customize your template a lot faster. We will work with such a layout in our examples below. Click Add Merge Fields to expand the corresponding options. Here is where you can add fields to your till receipt. First, select a field category, then select a merge field. In our example, we are looking into the Locations category and we are adding a Location Name field. Now that the field is selected, all you need to do is click and drag it onto the layout, wherever you want to place it. The field will be added at the location of your cursor. Please see the demonstration below.